Contrary to what most people believe, thatch is not simply grass clippings that aren't decomposing. Clippings can add to a thatch problem once the problem exists, but generally, clippings are very beneficial to the lawn when you have a healthy, bioactive soil. They decompose and recycle in as little as two weeks and help provide nutrients and organic matter. 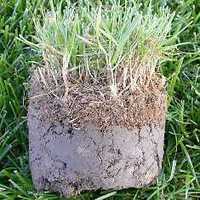 Thatch is actually a matted layer - of roots, stems, blades, runners and clippings - that forms on top of the soil. You might describe it as a lawn that is growing into itself rather than into the soil. If you try to poke your finger through your lawn and into the soil, and find that there is a matted, vegetative barrier of about 1/2 inch thick or more, you have a real thatch condition. I've seen thatch as thick as 3 inches. If you have real thatch, like above, then there is no way you can remove it with a dethatching machine ( sometimes called a power rake). Such machines can barely penetrate the thatch layer before tearing the grass right out of the soil. In our lawn care business we handle thatch with a 2 pronged approach. First we improve the soil under the thatch with our Aerify PLUS to make it easier and more desirable for the roots to dig deeper. Then we add on specific decomposition microbes using our Biological Dethatcher product. This digests the dead organic matter and turns it into beneficial humus. More on this below. Thatch can take years to develop on a lawn, but when lawns are sodded and not cared for properly you can get what I would call "instant thatch" . 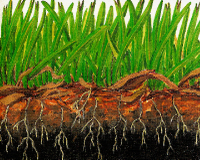 It happens when you lay sod on top of the soil and the sod does not root into the soil quickly or deeply. This often happens when the soil below the newly installed sod is dry and you don't water heavily enough to get through the sod to saturate the soil. The water stays in the sod and that's where the roots stay too. In some cases you get "instant thatch" because the soil underneath the sod is a very hard subsoil, and nothing can penetrate it. Thatch is undesirable for many reasons, a major one being that the roots of your grass are up in the thatch, and only barely in the soil (see the drawing below). This is not a healthy state and it makes the grass highly susceptible to insects, drought, and winter-kill. If the grass is not anchored in the soil, winter frost or ice could actually lift the thatch right out of the soil. When you have thatch, you have a weaker lawn. It is only a matter of time before something kills it off. A matted thatch layer will act like a sponge to absorb the rain or your watering. This wet matted layer promotes disease. If the thatch is thick, and the water isn't heavy enough, it might not even get through the thatch into the soil. The soil eventually dries out, and the grass roots will have to grow into the thatch layer itself-where there is some moisture-instead of into the dry soil. And this will only add more to the thatch layer. And it gets worse from there. One way to help get water through the thatch layer and into the soil, is to put on some dish soap before watering or before a rain. This will help thin out the water allowing faster penetration. 2 or 3 oz. per 1000 sf should do the trick. You could also put on a light application of Aerify or Aerify PLUS , before watering. You should test to see how deep your water is penetrating by cutting into the soil with a spade and looking to see if the soil underneath the thatch is moist or not. The only time when thatch may be desirable is when the grass is growing over tree roots near the surface. In this case, there is hardly any soil so the grass is doing what it can to survive. There can be a few reasons for thatch forming on lawns aside from the poor sodding situation as mentioned above. But in general, a thatch condition indicates that there is something wrong with your soil. It is either preventing the grass from rooting (compaction or clay) or it is not bioactive or healthy enough to promote the decomposition of dead organic matter. Your soil should be teeming with microlife instead of "dead", or sterile. If you've been to our website at www.natureslawn.com you know that soil improvement is our main focus. Soil compaction, clay, and poor pH (too acidic or alkaline), will all discourage bioactivity. And if you've used a lot of conventional lawn fertilizers that are high in chlorides or salts, or you've used excessive pesticides. you may have killed off a lot of beneficial soil micro-life yourself. FYI: Lack of earthworms is an indicator of a bad soil. In fact, you'll rarely see thatch where earthworms are abundant because along with being great soil aerators, they are one of nature's best thatch digesters. You can not handle a real thatch condition with a dethatching machine or power rake. You would end up ripping out the lawn. These machines will take care of surface issues like dead or matted grass, clippings and debris - and you can have bushels of that stuff with some grass types. But as far as getting out the real thatch, the interwoven mat, it would barely scratch the surface of it. The real solution to thatch, and the best way to prevent it, is to improve your soil so it is aerated and bioactive enough to get the thatch to decompose. When you do this, the thatch - which is part Organic Matter, will gradually begin to break down from the bottom (where it is in contact with the soil) up. It will turn into rich, dark humus. It can take a couple of years to fully break up the thatch, but it will happen. You need to keep the soil moist underneath the thatch layer. When it dries out, decomposition ceases. Less frequent, heavy waterings are best. If you water too often and keep the whole thatch layer moist all the time, you are asking for trouble with fungus. Also, you want to encourage the roots to go down into the soil for water and not stay in a wet thatch layer. Collect your clippings until the thatch problem is handled. They will only add to the thatch. Test the pH and add Lime as needed. If your soil is Acidic it could dramatically slow down or even prevent thatch decomposition. Over-liming will also cause the same problems. Increase thatch degrading bioactivity. You can do this by improving your soil quality with compost or simple compost teas (soak compost in a bucket of water for a day and spray the liquid over the lawn). You can treat the thatch with Biological Dethatcher. It contains specific microbes and enzymes designed to generate and accelerate thatch decomposition. Improve soil aeration. Thatch-degrading microbes, and most beneficial soil microbes need air to survive. Compacted or heavy clay soils suppress the micro-life in the soil. Improving aeration is a must if you want to increase the soil bioactivity. Visit our website for more information on better ways to increase aeration. Your lawn will need regular fertilizing because soil microorganisms need nitrogen to decompose thatch. You want to avoid any fertilizers that contain muriate of potash (potassium chloride) because chlorides can be harmful to soil life. Straight organic granular fertilizers may not be the best choice here because unless they are water soluble, they will sit on top of the thatch layer and be very slow to break down and release their nutrients. After all, a lot of the thatch is already organic matter that isn't breaking down fast enough. Liquid fertilizers may be the best idea when thatch exists. They will go right through to the soil when watered in, and won't get stuck in the thatch Monthly or twice monthly applications of a salt and chlorine free liquid fertilizer will provide more available nitrogen and therefore will promote faster thatch decomposition. All-In-One for LAWNS is a liquid fertilizer that also contains our Biological Dethatcher along with some Aerify PLUS. Building A Healthy Lawn: A Safe and Natural Approach and President of Nature's Lawn and Garden.